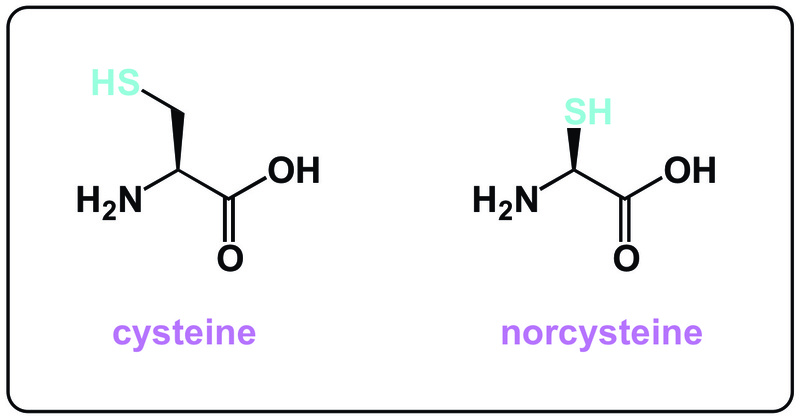 Today I want to talk about norcysteine, an unnatural analog of cysteine that has the methylene group “taken away”. That’s right. You might imagine that the corresponding SS bonds would be really different (shorter or longer SS bond?) from typical Cys-Cys connections. The thing for me is that the aldehyde oxidation state of the alpha-carbon might not mesh well with a reasonable expectation for configurational stability of this particular amino acid. However, norcysteine-containing peptides are configurationally stable at the alpha methine position. One can imagine a ton of applications for this molecule. I doubt we will see a variant of the native chemical ligation, but who knows?